An inviting entrance not only attracts good fortune, it can also attract people – and potential buyers. As feng shui involves all of the senses, scented flowers, melodic wind chimes and harmonious colours all help to draw people in. It’s said that most buyers make a decision within 15 seconds, so it’s worth getting it right! 1. Clean and declutter your property, inside and out, and check that paths, gates and fences are all in good order. On an unconscious level, dirt, weeds and peeling paint can conjure up feelings of poverty. 2. First impressions count, so do your own drive-by. Is your house number obvious? What subconscious symbols might people pick up on? 3. Pack away the majority of your personal items, such as family photographs. Remove paintings that feel lonely or depressing and replace with feel-good images. 4. 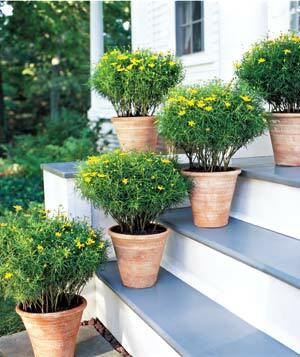 Place pots of yellow flowers near your front door or pop a fresh bunch into a vase. Not only is yellow an uplifting colour, it’s said to encourage sales. By combining her skills in feng shui, colour and design, Jenny can offer cost-effective styling suggestions – improving your home’s appeal and attracting buyers. Jenny is currently based in Sydney and reguarly visits Byron Bay/Gold Coast.